After I published the On The Buses article Tommy Jones reminded me about the car stickers produced by the now defunct Cheshire Observer in the mid-1970s. As a follow up I thought it might be an idea to put something together about these posters which even at the time seemed peculiarly dated. I did write about them in a programme article earlier in the season but I’ve included a couple of additional examples for this piece. I seem to remember that the very first one was launched during summer 1974 and have a vague memory of the Cheshire Observer asking readers what the phrase “Chester 3-4-5′ meant. At the time there was no indication that the phrase was linked to Chester FC so I don’t think anyone initially had any idea what on earth it was all about. For those still unsure it meant Chester for Division Three 1974/75. It may make vague sense now but it certainly seemed obscure when it was introduced. I haven’t got an example of the Chester 3-4-5 sticker but if anyone else has got one I’ll add it to the piece. Chester 3-4-5 was quickly followed by Support Chester FC and then Forget The Cup We’re Going Up after the League Cup Semi-Final defeat to Aston Villa Following promotion the Observer went into overdrive and produced the classic “Let Chester Shout With Glee Seals Are In Division Three”. Possibly the last time the word glee was used in any sentence until the recent television programme salvaged the word from obscurity. Flush with success the Observer then produced two more stickers for the first season in Division Three. 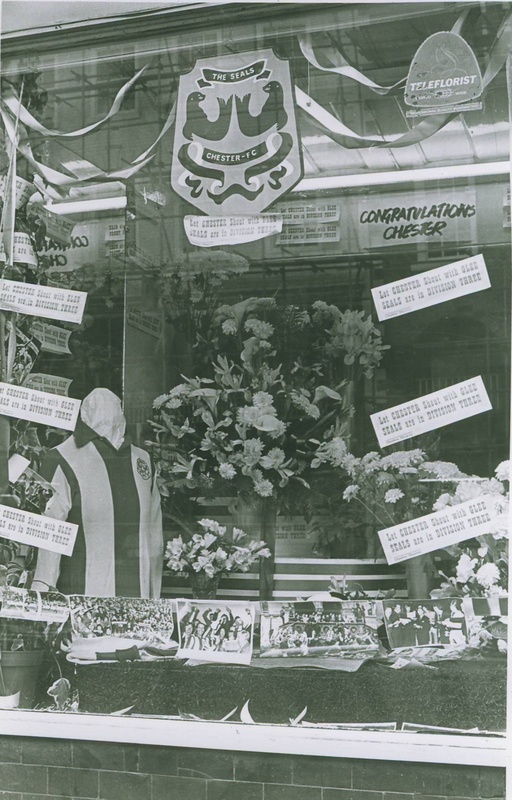 Chairman Reg Rowlands went to town with the stickers following promotion by proudly displaying a selection in the window of his florist’s shop in Bridge Street along with other memorabilia. I’d be interested to hear from anyone who knows if any other stickers were produced. 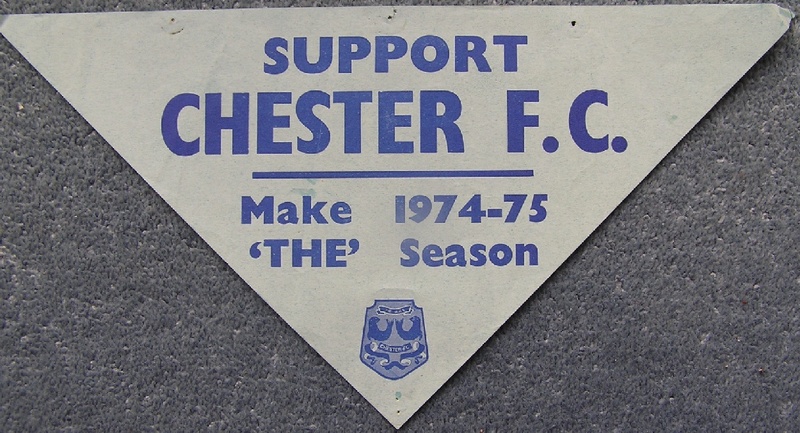 Older Chester supporters may remember the match adverts that used to appear on the maroon Corporation buses in the 1970s. I can remember the luminous green posters on the school buses and it was not unknown for them to end up in the hands of Chester supporting school kids. I managed to pick up a couple myself after they mysteriously worked themselves loose from the bus window. Larger versions of these garish adverts were also located on boards outside the Stadium. In the late 1970s it was possible to buy small card versions for 10p from the club shop which used to occupy the Georgian House on Grosvenor Road. At a recent Senior Blues meeting I was talking to supporter Fraser Warburton who was telling me that these adverts appeared on buses as long ago as the early 1960s which surprised as I always thought they were a 1970s phenomenon. The examples here are from the 1961/62 season when Chester played in green and gold and this is reflected in the colour of the posters although it looks the background may have faded slightly. Fraser remembers cycling down to Stamford Road in Blacon where the buses used to wait before returning to the city centre, and asking the conductor if he could have the posters. 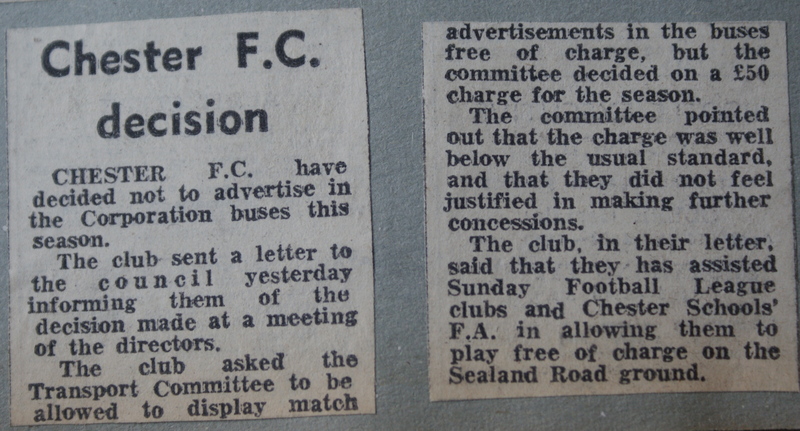 Games continued to be advertised until summer 1967 when the club objected to the council’s decision to charge £50 to continue with the arrangement. The adverts re-appeared in the 1970s and my first example is from 1976 but I have a feeling they may have existed before this date. Does anyone know when and under what circumstances they came back? I’m wondering if it coincided with promotion in the 1974/75 season when the council were perhaps eager to cash in on the club’s success. The last dated poster is from 1978 but again they probably remained on buses for a short time after this as I have some of the cardboard adverts from the 1979/80 campaign.I’m not sure that these adverts would work in the present day with de-regulation and anonymity of current buses and I’m sure health and safety would have a say about sticking posters on windows. Nevertheless they were an extremely useful marketing tool for the era when there were far fewer media outlets.